Caution reminds me of the great critic Ernest Newman and his life-consuming love of Richard Wagner. On his deathbed, aged 90, Newman asked to hear records of Wagner’s opera Parsifal. With his last breaths, he apparently croaked, “I must get well, you know—some new ideas about Parsifal have just occurred to me.” Replace Parsifal with The Queen Is Dead and my own potential fate is all too terrifyingly obvious. I’d argue that one of the main reasons Goddard has that kind of relationship with The Smiths’ discography is because it’s so compact. The Smiths produced a lot of music—great music, mostly—in a short amount of time, yet all of it can be contained on just a handful of CDs, with very little in the way of true “rarities” left uncompiled. Goddard’s book notes a few alternate takes and scrapped sessions, but The Smiths didn’t leave many songs unfinished or unreleased. When Rhino reissued the remastered Smiths catalog a couple of years ago, I interviewed guitarist Johnny Marr, and asked him why there were no extras in the box set. He told me, “There wasn’t stuff laying around on the cutting room floor, musically or aesthetically. We didn’t try stuff that didn’t work. Everything we did, we put out. Every song, every sleeve.” And though The Smiths recorded almost non-stop during their five years of existence, the total amount of music is fairly small. That scarcity matters, because it makes each song more precious. Some musicians are prolific to a fault, releasing outtakes and live tracks along with their albums and singles, and while that can have value, it mainly serves to turn their fans into curators. Last year I started getting interested in current singer-songwriter Tim Cohen and his many projects (The Fresh & Onlys, Magic Trick, Feller Quentin, etc. ), but Cohen has so much material out there that it quickly became useful to winnow my Tim Cohen iPod playlist down to the handful of standout songs on each record. Compare that to Japandroids—another band I got into last year. They’ve been in existence longer than The Smiths were, yet Japandroids have released only about 30 songs, which means I’ve had to think hard before cutting any of them from my iPod. Or consider My Bloody Valentine. After 22 years of silence, with only two albums and few EPs in print over that time, the band suddenly released nine new songs a few weeks ago, and I’ve been listening to those nine over and over ever since. There’s no chance I’ll be deleting any of them from my library any time soon. Of course, it helps that all of the new My Bloody Valentine songs are good-to-excellent. But then that’s another argument in favor of scarcity: The artists tend to be choosier too, making sure that each song is worth adding to their curt résumé. Trust me: As someone who bought a lot of albums by The Smiths’ peers in the ’80s British music scene, the band’s hit-to-miss ratio was superior. Even some of my favorite acts from that era—Echo & The Bunnymen, The Psychedelic Furs, New Order—filled out their albums with atmospheric exercises and goofs. Nearly all Smiths tracks, good or mediocre, are full-on, well-constructed songs, clearly given a lot of thought and care. The curious thing about The Smiths’ limited output, though, is that when I first became a fan, their discography seemed daunting. The first Smiths song I ever heard was “How Soon Is Now,” in 1985, via a video on MTV—watched in my grandparents’ den while the rest of the family played cards in the other room. When I went looking for the band’s albums in a mall record store, I was overwhelmed by the surfeit of imports (including a copy of the anthology Hatful Of Hollow that was misfiled and mispriced as a single, which meant it ended up costing me something like four bucks). From talking to Marr and reading Goddard’s book, I learned that The Smiths’ habit of releasing so many of their songs on singles instead of albums drove their record labels batty, in the U.S. and the U.K. But that approach was the best way to keep up with the torrid pace that Marr and frontman Steven Morrissey were setting as songwriters. They had too many good ideas coming too quickly for them to back-burner any of them. The only way for The Smiths to keep moving forward was to record what they wrote almost as soon as the songs were done, then move to the next thing. Songs That Saved Your Life does a fine job of tracking Morrissey and Marr’s rapid development, from the moment the latter appeared on the former’s Manchester doorstep and asked him to be his partner through their first attempts at writing songs together, both influenced by the same mix of ’60s pop and early New York punk. Marr was only 19 at the start—Morrissey was 23—and still learning how to coax the sounds he wanted from his guitar, but he was savvy enough to know how to keep his experiments bounded within what would quickly become a recognizable Smiths sound, while Morrissey wrote words that both fit the moods that Marr evoked and framed his own outsized personality. Goddard’s book is an invaluable resource for Smiths fans who’ve ever wondered where Morrissey’s wordplay came from. A lot of his lyrics were cobbled together from movie quotes, old songs, and passages from his favorite books. But Morrissey made his swipes seem like confessionals, and for all the crap The Smiths took over the years for being mopey—a reputation earned by song titles like “Miserable Lie,” “Suffer Little Children,” and “Heaven Knows I’m Miserable Now”—Morrissey soon moved beyond mere world-weariness to songs as snotty as “Bigmouth Strikes Again” and as heartfelt as “There Is A Light That Never Goes Out.” With bassist Andy Rourke and drummer Mike Joyce providing the drive, and Marr providing the depth and texture, Morrissey felt free to vamp. 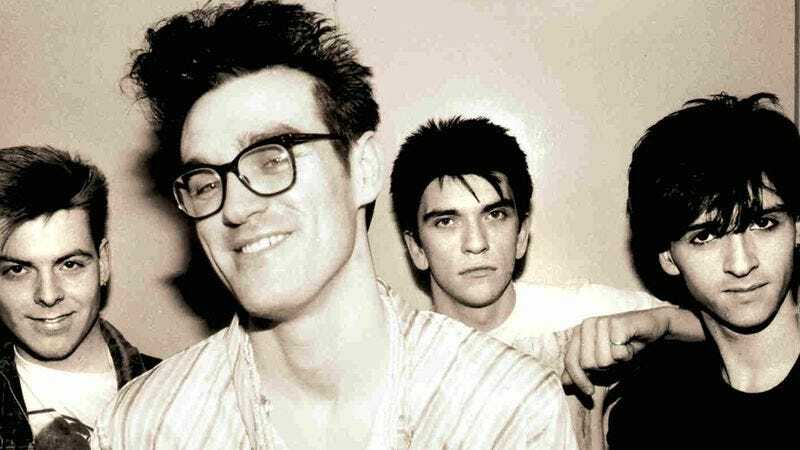 Once I caught up with The Smiths—something that accidental import copy of Hatful Of Hollow made easier—their discography immediately shrunk from overwhelming to paltry, and I reached that stage many fans do with their favorite bands, where I consumed each new piece of music hungrily. In the summer of 1986, I spent a month at a summer camp for the humanities alongside high-schoolers from across Tennessee, and by pure chance I roomed with a kid from Chattanooga named Chris, who was an even bigger Smiths fan than me, and owned singles I didn’t even know existed. I heard “Shakespeare’s Sister,” “The Boy With The Thorn In His Side,” “Rubber Ring,” and “Asleep” for the first time thanks to Chris, and when The Queen Is Dead was released that summer, Chris bought it from the local record store and we played it over and over on the stereo I’d brought with me from home. He and I also exchanged letters for a time, and when Louder Than Bombs came out a year later, we wrote long critiques of each of its songs to each other—even the ones I’d already heard either on Chris’ singles or on Hatful Of Hollow. In terms of galvanising their original home fan base, The Smiths’ U.K. television career is a vital part of their story. The advent of YouTube and other archive sites means it’s now possible for today’s hideously spoilt and woefully complacent youth to casually enjoy practically all of it at the touch of a search engine; not for them patient evenings battling cramp, kneeling in front of the video player, fingers nervously trembling above the record button for fear of missing so much as a nanosecond of Smiths action. All things being equal, I prefer the world of today, where if I develop a new musical interest I can pursue it practically instantly (and relatively inexpensively). And there are still inaccessible artifacts out there. While reading Songs That Saved Your Life, I searched through the web for some of the unreleased Smiths songs—such as the Troy Tate-produced version of their first album—and had only scattered success. (In our interview, Marr told me he’d like to see that material get out there legally some day, but there are apparently contractual reasons why it can’t yet.) My biggest problem—musically speaking—is that there’s so much to listen to that I don’t know whether it’s worth my time to keep circling the same 60 or so Smiths songs. Ironically, Songs That Saved Your Life is now part of that instant-access/demystification process that Goddard decries. Check the Wikipedia entry on any given Smiths song—odds are, it cites Goddard’s book as a resource on the song’s recording history and meaning. As a fan, I’m happy to have that information. But that’s only because I still have my memories of sitting around a dorm room with my friend at age 15, playing “Cemetry Gates” over and over, debating what “Keats and Yeats are on your side / While Wilde is on mine” could possibly mean, with nothing but our passion and clean, new vinyl to support us.